Scientists have examined the historical record of long-term climate change and have uncovered a rather dramatic correlation, although the cause for it is still not well understood. During the recent century and decades, space weather has played a role in short-term climate change and has led to several controversial proposals. This figure shows the reconstructed sunspot numbers for the last 12,000 years based on cosmic ray data recovered from carbon-14 isotopes found in wood samples. Reconstructing solar activity during the last 12,000 years – This 2004 article by S. Solanki and his colleagues at the Max Planck Institute was published in the journal Nature (vol 431, p. 1084). It describes the recovery of carbon-14 isotopes from dentrochronological studies of tree rings dating back to 11,400 years ago. The cosmic ray influx to the atmosphere creates carbon-14 isotopes which find their way into biological systems. Because cosmic rays are anti-correlated with solar activity, by measuring the carbon-14 abundances and correcting for the familiar decay process for this isotope, you can recover the cosmic ray flux of past years, which can be related to solar activity just as sunspot information is. This study reveals that, as shown in the recent red data in the above figure, we are entering an unusually active period in solar activity which we have not apparently experienced since just after the end of the last Ice Age. They conclude, however, that the sudden increase during the last 100 years may not account for the entirety of the Global Warming effect which has been detected in recent decades. 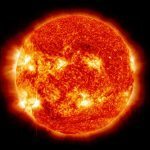 Reconstructing solar activity from ice core isotopic studies – This 2003 article by Ilya Usoskin and his colleagues, was published in the journal Physics Review Letters (vol. 91, 211101-1–211101-4) as well as a second article by Sami Solanki and his colleagues in the Journal of Geophysical Research (vol. 108, p. 1200). They measured the beryllium-10 isotope in icecore samples from Greenland and Antarctica. They were able to reconstruct the solar activity for the last 150 years by a direct check with actual sunspot records, and extend this reconstruction to 850 AD. For most of the last 150 years, sunspot activity has been a good predictor of global annual mean temperatures, which climatologists argue is the evidence that says the changes in Earth’s temperature through much of this time has been largely due to the sun. However, the data shows that since 1980, this correlation has weakened and is no longer a good predictor of global temperatures. This is also the period which climatologists identify as the Global Warming era. The ice core data confirm that during the last 60 years, we have been in an era of unusually high solar activity which has no equal during the last few centuries, however this only accounts for a fraction of the sharp increase in temperatures since 1980. Reconstructing solar activity and the recent global warming episode – This research was published in 2001 by Eigil Friss-Christensen in the book ‘Space Storms and Space Weather Hazards’ (NATO Science Series vol 38, p. 231, Kluwer Academic Publishers). Based on a comparison of the sunspot cycle length with Northern Hemisphere land temperature changes since 1850, a close correlation is found between 1850-1970, in which changes in the sunspot cycle length are reflected in changes in the mean temperature. As the cycle length decreases from 11.5 to 9.8 years, the mean temperature increases by 0.4 C. However, although this sunspot cycle change seems to account for nearly all of the temperature change prior to 1970, since that time the correlation has begun to break down and by ca 1998 this solar effect only accounts for (or correlates with ) half of the warming. 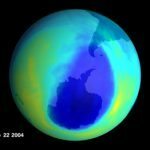 This supports the prevailing idea among climatologists that Global Warming has entered a new phase in the last few decades where a non-solar mechanism (e.g.Carbon Dioxide) has begun to take over in raising Northern Hemisphere mean temperatures. See the excellent review article by Charles F. Keller (Los Alamos National Laboratory). 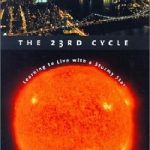 Reconstructing solar activity by looking at sun-like stars Part II – This research was published in 2004 by astronomers Jason Wright and Geoff Marcy. They examined the ‘Maunder Minimum’ stars discovered by Vaughan and Baliunas at Mt. Wilson, and discovered that these are not sun-like stars at all. They are actually much brighter and older, in some cases by billions of years, so it is impossible to determine if the same physics is operating in this older population or not. In fact, their activity may be absent because their magnetic fields are no longer available to create the activity cycles. Reconstructing solar activity and Global Warming in the 20th Century – This 1999 paper by Michael Mann, Judith Lean and Jerry Mahlman was delivered at the United States Global Change Research Program’s seminar on November 23, 1999. It may be a bit out of date, but it summarizes studies of past climate and global warming/cooling events and relates them to the present period of warming since the 1980’s. Their main conclusion, based on satellite measurements of the ‘solar constant’ is that this important input to climate has not significantly changed during the period (two complete sunspot cycles) when a sharp increase in global temperature has been recorded. They conclude that the sun is not a significant cause for recent global warming, though it has been during the many centuries preceding the current warming era. Reconstructing solar activity by looking at sun-like stars Part I – This 1998 research has been conducted at the Mt. Wilson observatory based on measurements of hundreds of sun-like stars. Each star has been measured on a regular basis, and what was found is that many of them display what astronomers Baliunas and Vaughan call a solar activity cycle analogous to our sun’s 11-year sunspot cycle. Many of the stars, however, do not show this behavior, leading the astronomers to believe that they are stars we are seeing in a ‘Maunder Minimum’ phase. The solar activity cycles for G and K-type stars have much in common with the sunspot cycle of our own sun. Some of the cycles are as short as 5 years while others are as long as 30 years.